KI (potassium iodide) is being distributed right now within the 10 kilometre “zones” of the Pickering & Darlington Nuclear Generating Stations (PNGS & DNGS) – two very large nuclear generating stations (10 operating reactors altogether; 6 at Pickering, 4 at Darlington) located east of Toronto, Canada’s largest city. This is by order of the Canadian Nuclear Safety Commission (CNSC), Canada’s federal nuclear “regulator.” More details below. So, if you live in the 10 K “zone” around PNGS or DNGS, you will be receiving KI pills (by mail). The DNA group was calling for KI pre-distribution back in 1997 (possibly even earlier) – specifically, for the emergency evacuation zones to be expanded from 10 K to 30 K, and for KI to be pre-distributed to everyone within the 30 K zone. In New Brunswick, every resident has received KI in the 12 K “planning” zone, as well as within the 20 K “planning” zone of the Point Lepreau plant – since 1982 (they are delivered there door-to-door). More “official” information about this program here. KI Resources page on this site. Potassium iodide will protect the thyroid gland from radioactive iodine in the event of a nuclear accident. Children are particularly in need of this protection and particularly susceptible to thyroid cancer if not so protected. Thus, having KI on hand in the event of a serious nuclear accident is a protective measure. Having it ahead of time is essential, since during the disruption that inevitably follows a nuclear accident, obtaining KI pills is liable to be a low priority for citizens (& authorities) trying to cope with a plethora of other pressing challenges. Last week Beyond Nuclear reported on recent studies about thyroid cancer incidence in Japan since the Fukushima nuclear disaster began on March 11, 2011. Incidence is up dramatically, particularly in areas well west of the plant, where people were not evacuated. Plenty of news about this on the Beyond Nuclear site here. As well, the Toronto Star had an article about this recent research evidence. KI pills were not distributed in Japan prior to the accident, nor at the time of the accident. A great many things went awry in the wake of the nuclear disaster. Evacuations were botched (including leaving people in what were known for weeks to be "hotspots)," orders to distribute KI fell between bureaucratic cracks, and overall, it is said, the “chain of command” in response to the nuclear disaster broke down. ** Extremely important to note: thyroid cancer is not the only health impact possible. More on this below. In reading the book Voices from Chernobyl - The Oral History of a Nuclear Disaster (by recent Nobel Prize for Literature winner Svetlana Alexievich) I came across this comment about KI pills post-Chernobyl accident: “Those who could, got potassium iodide (you couldn’t get it at the pharmacy in my town, you had to really know someone).” <pg. 85> Not many could have taken it at the right time in any case, since the government failed to notify the citizenry until several days after the accident took place. Almost exactly a year ago (after much discussion, Fukushima “enhancements” to the Canadian nuclear plants, &, dare I say, public pressure) Canada’s nuclear “regulator” ordered that KI pills be pre-distributed to households within the 10 K “zone” of the country’s nuke plants. So, at 4:01 pm on Friday, October 10th last year (the Friday of Canadian Thanksgiving, a long weekend here), CNSC sent out a news release about what they call REG.DOC.2.10.1 & the plan to distribute KI pills. They might have been aiming to miss the media with that late Friday afternoon release, but it didn’t work out that way, and there was a fair bit of media coverage that weekend & early the following week. Then, 4 days later, on October 14th, CNSC sent out a message with this info: “Four independent third party studies explore and describe the benefits of distributing KI pills in advance to citizens within a 30-mile (48 kilometres) radius of a nuclear power plant, and the need for timely and correct consumption of these pills in the case of a nuclear accident. The studies indicate such preventative measures can greatly reduce the accumulation of radioiodines in the thyroid gland, as well as the resulting radiation dose. This is an essential measure, since thyroid cancer –, most specifically in children and infants – is one of the most frequently observed consequences of a nuclear accident. The studies also highlight the need for appropriate administrative policies and increased research on the topic of children and infant consumption of KI pills, to better understand both the effectiveness and the safety of these measures. Note: the media apparently did not receive this info. This was sent merely to the many of us who are on an information list for CNSC messages. Interesting that the press got the 10 K info … but not the info about 10 K probably being insufficient. Meanwhile, in Switzerland, in the wake of the Fukushima disaster, the nuclear regulator did modelling to assess the likely impacts of a Fukushima-scale (International Nuclear Event Scale or INES Level 7) nuclear accident. They carried this out transparently (in stark contrast to CNSC’s “severe accident study” debacle; the severe accident study that was clearly NOT a severe accident study – all thoroughly laid out in the posting ‘Severe Accident Study. Oops. Not really!’), and concluded by sending out KI pills to all Swiss citizens within a 50 K radius of their nuke plants. Info on this here (en français). The American Thyroid Association, btw, recommends pre-distribution to 50 miles (not kilometres) & comments “No one can predict how far a radioactive iodine cloud might spread” & recommends 3 levels of coverage. Check out the brochure for yourself here. In all the hoopla surrounding this discussion taking place in Durham Region these days, it would be very easy to lose sight of a highly important fact: thyroid cancer is not – not by a long shot – the only possible/likely health consequence from exposure to radiation following a nuclear accident. There are myriad others. Note links below in the Resources section for information about health consequences – not just of exposure following an accident, but from “routine” emissions from nuclear plants. 2nd note: As just stated above, KI does not constitute emergency planning! With all the fuss being made by CNSC, OPG, Ontario’s health ministry and the Durham Region Health Department, a person could be fooled into thinking something of substance is taking place here. Really, it is not! KI will not prevent an accident from happening. It will assuredly not make you "safe." It will also not protect you (or your loved ones) against the many other possible health consequences if an accident does take place. Nor, of course, from so-called Routine Releases. I hope it’s becoming clear that it's probably a pretty sensible idea to develop a healthy skepticism about claims made by the nuclear industry (& our “authorities”) regarding so-called nuclear “safety” & official readiness/preparations for a nuclear accident (the latter, we note, meaning “off-site” emergency response, being a provincial, regional and municipal responsibility). If you’re not convinced yet of the need for a little digging, please look through the list of recent postings on this blog that you’ll see over to the right-hand side of the page. Severe Accident Study. Oops. Not really! American Thyroid Association, brochure about KI, brochure about thyroid cancer, emergency planning in Ontario, health effects after nuclear accident, INES Level 7 event, KI distribution in Durham Region, KI distribution in Switzerland, links about Chernobyl, much ado about nothing, nuclear emergency planning, quotes about Fukushima, quotes about nuclear accidents, recent news about thyroid cancer, recommendations about KI, resources about Chernobyl, routine emissions, routine releases, Svetlana Alexievich, thryroid cancer in Japan, thyroid cancer, thyroid cancers after Chernobyl accident, Voices from Chernobyl, will KI make you safe? Darlington Hearing: Weigh in ... & watch! DEADLINE: Monday, Sept. 28 (at midnight). What's It About? Why is this Licence a Bad Idea? OPG (Ontario Power Generation) is asking for a 13-year licence to refurbish (i.e., rebuild) & continue operating 4 reactors at Darlington Nuclear Generating Station (DNGS) -- at huge public expense. Building these reactors will cost Ontario taxpayers a fortune! At least $10 billion. Probably way more. Heck, the project is already costing us a fortune. OPG’s past licences have never been for more than 2-5 years. Thus, this request is unprecedented. Such a long licence is not necessary; other reactor operators in Canada have neither requested nor been granted such a long term. Bruce Power went through a licensing hearing earlier this year at which they asked for, & were granted, a 5-year licence for similar activities, i.e., refurbishment & continued operation. A licence of this length is a way of reducing public scrutiny over OPG’s operations at Darlington. If DNGS gets a 13-year licence, members of the public would not have the opportunity to oversee what is going on at the plant until 2028. Public hearings allow citizens to review OPG’s operations, and to ask questions. This ensures that OPG remains accountable to its host community. Regular re-licensing hearings allow the public & independent CNSC commissioners to scrutinize both OPG operations & CNSC staff oversight of OPG. Reduced public scrutiny can increase the risk of an accident if OPG & CNSC staff are not regularly – and publicly – held accountable for their actions. This is what occurred at Fukushima. Lack of proper scrutiny & oversight (proper regulation) led to the Fukushima accident, assessed to be a “man-made” accident (you can check out this posting for many relevant quotations about the causes of the Fukushima accident). Emergency planning in Durham Region/the Greater Toronto Area is gravely inadequate in the event that a serious accident occurs. The plans have been made under the assumption that only a mild accident with a minor release of radioactivity would take place. All explained more thoroughly here & here. Bottom line? Residents of Durham Region/the GTA are not safe to assume they'll be well protected in the event of a serious nuclear accident. Most citizens of Durham Region & Toronto actually don't have a clue what they would do if an accident did take place. People are not well-informed. We don’t seem to be able to count on Canada’s nuclear “regulator” to tell us the truth about nuclear safety, nuclear studies, & so on. The Harper government has turned a nuclear watchdog into a lapdog. Canada’s nuclear regulator claims its staff has conducted a “severe accident study” that indicates a “serious” accident wouldn’t really cause too much of a problem. Problem is, the study is not what it claims to be … not at all. Best to read the previous post to get the lowdown. Nuclear refurbishments create (literally!) tons of new nuclear wastes. We all know there is nowhere safe for any of that stuff to “go.” Plenty of detailed info on that topic here. It just doesn’t seem that OPG’s plans for Darlington are worth the risk. You know what? I haven't even mentioned Lake Ontario, & what nuke plants do to the bodies of water they are located on. Holy smokes. Major omission. The Lake Ontario Waterkeeper site has some recent info; why not check that out? For sure, Lake Ontario takes a bit hit from this plant. Nor should we be risking the drinking water source for millions of people. Nosirree. Those of us experienced with nuclear hearings & nuclear industry dealings find the CNSC doesn’t pay much attention even when a very large number of people tell them their licensees & licensees' plans can't be trusted. I say this advisedly, having taken part now in 10 hearings over the past 9 years. Why do we keep showing up at CNSC hearings when the CNSC doesn’t really seem to be listening? Because we need to get other people to listen! Municipal / regional / provincial politicians – who can exert pressure on the Premier of Ontario. It is up to Ontario’s Premier to sign off on this refurbishment project. They live here too, so they're just as much at risk as you & I.
It’s dangerous that so few people & so few politicians are paying attention to serious nuclear risks & seriously deficient nuclear emergency planning. Nuclear accidents are happening around the world at the rate of one every 10 years. There is no way under these circumstances that OPG should be permitted to operate behind closed doors for 13 years. Current provincial emergency plans are built around the assumption of a minor accident in which no large release of radioactivity takes place immediately. Unsafe, unreasonable assumptions. Plans for a serious accident, then, are not robust. In Durham Region, what this means is that DEMO (Durham Emergency Management Office) is only really prepared for the evacuation of people in the immediate vicinity of the plants (Pickering or Darlington). Not for a big accident – a Level 7 on the INES (International Nuclear Event Scale) – like the Chernobyl and Fukushima disasters. Where tens of thousands of people needed to be evacuated … quickly. DNA has been working to inform local politicians about these gaps & deficiencies, & it seems to have sunk in (with some, anyway) that most people really actually have no idea what to do if a serious accident happens. We Canadians are so polite, though, aren’t we? Polite to a fault. So polite we do not safeguard our own … safety. You need not be a rocket scientist, nor possess a Ph.D., to speak clearly & concisely to the CNSC & express your lack of support for this refurbishment/life extension/13 year licence. Short & sweet (well, no need to actually be sweet) will do nicely. From the heart is always best! Just note down the things that irk or concern you the most, & fire it off by midnight on Monday, September 28th. Once again, details on making a submission are right here. Please take a look through recent postings on this site for relevant, related information. Each posting lists many additional resources at the end, should you be keen to learn more. It can’t happen here!/Severe Accident Study?/It’s the planning basis, Stupid! Nuclear Emergency Planning: Did You Know? 1. A very large number of agencies are involved in nuclear emergency planning. Ontario Power Generation (OPG) and the (federal) Canadian Nuclear Safety Commission (CNSC) have responsibilities for on-site emergency response, while off-site emergency planning is the responsibility of the Province of Ontario. Within Durham Region, the Durham Emergency Management Office (DEMO) is responsible for implementing provincial plans. With the dauntingly large number of federal, provincial, regional and municipal agencies involved, there is a very real risk of bureaucratic mix-ups in the event of a major accident. Such mix-ups occurred both in Ukraine following the Chernobyl accident, and in Japan following the Fukushima accident. 2. Sufficiently detailed plans for a serious nuclear emergency do not currently exist. Plans currently in place under the PNERP (Provincial Nuclear Emergency Response Plan), the TNERP (Toronto Nuclear Emergency Response Plan) & the DRNERP (Durham Region NERP) are for a smaller accident, not for a Chernobyl or Fukushima-style major accident or very large radioactive release. The emergency exercise carried out at the Darlington Nuclear Generating Station in May 2014 involved more than 50 agencies – but no members of the public – and was not planned around the possibility of a major accident. 3. The Ontario and federal governments have failed to review & revise the Province’s nuclear emergency plans to address accidents involving large radiation releases since the Fukushima nuclear disaster took place in March 2011. 5. “Sheltering in place” (i.e., staying where you are when you are notified of a nuclear accident) may be an early instruction, but in the case of an actual release of radionuclides from a nuclear power plant, most ordinary houses will not provide adequate protection from all exposures, again stressing the need for effective evacuation planning. 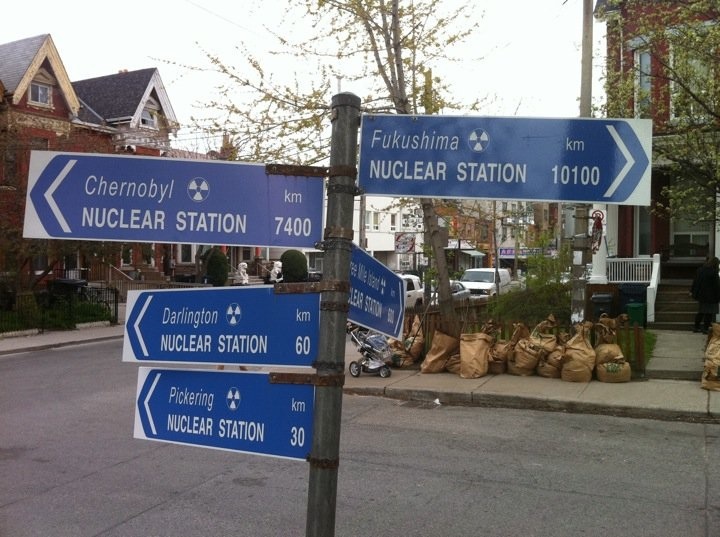 Evacuation plans and routes and locations of evacuation centres are not familiar or known to people in Durham Region or the Greater Toronto Area in general, who might have to evacuate quickly in the event of a serious nuclear accident at Pickering or Darlington. 6. The Province of Ontario determines the “zones” of notification in which public alerting after an accident & the distribution of potassium iodide pills (see below), must be carried out. These zones are both arbitrary and inadequate, and in no way reflect the distances over which radiation may in actuality travel, or where dangerous hot particles may ultimately land. 7. Potassium iodide pills (known as KI pills) must be taken as soon as possible after a major radioactive release in order to prevent the thyroid gland from absorbing radioactive iodine, possibly later resulting in thyroid cancer. This is an important action to reduce the risk of damage to the thyroid gland, but is only effective if taken at the right time (i.e., just before or at the very beginning of a radioactive release). It must be noted that KI does not prevent the absorption of a host of other radioactive isotopes that could be released to the air and unwittingly breathed in, and so, as already outlined, effective evacuation is also key. Canadian Environmental Law Association (CELA) documents on nuclear matters, in particular Emergency Planning here. 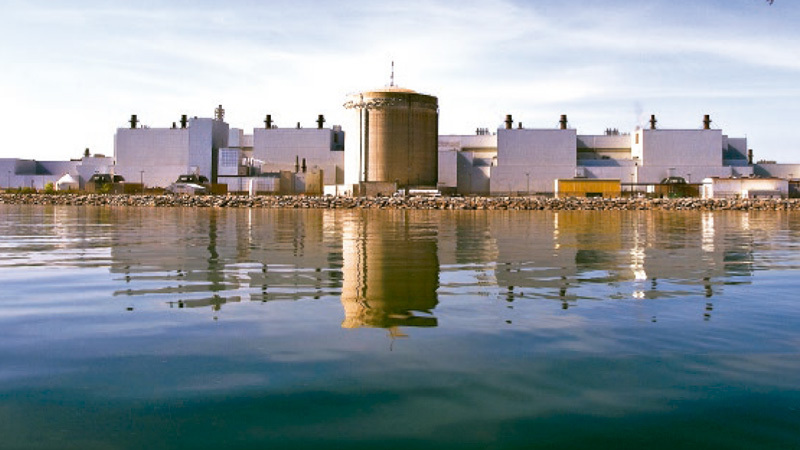 Is Ontario Ready for a Nuclear Disaster? Should I take radiation protection pills?